A Dutch painter and etcher, Seghers is often called an artist of unconventional landscapes. His work was highly praised in the 17th century and influenced the Dutch master, Rembrandt (1606 – 1669) so much that he collected eight works by the artist. Seghers’ work was influenced by his teacher, Gillis van Coninxloo (1544 – 1607, who brought forest landscapes to prominence; dwarfing his human figures to capture the immensity of nature. Like many prominent painters of his time, Seghers was also influenced by the innovative landscapes of Adam Elsheimer (1578 – 1610). Working in Amsterdam, The Hague and Utrecht, the artist was documented in the Haarlem Guild of Painters. He may have also traveled to Italy and Dalmatia, as his paintings imply an intimate vision of certain landscapes unique to those regions. His varied influence gave him an important role in progressing the landscapes from the dominant style of Mannerism in Flemish painters during the 17th century. 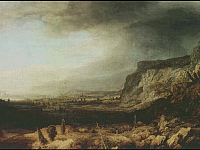 A limited number of his paintings survived, including one originally from Rembrandt’s collection, Mountain Landscape, now in the Uffizi Gallery. His surviving etchings are also rare.